This beautiful coin belongs to the collection of Mr. Bogdan Costin, through the kind permission of whom the pictures are present on Romanian coins. This silver coin was issued by Vladislav (Vlaicu) I of Walachia, the first Romanian prince known to have struck coin. As a type this coin is known to Romanian numismatics as Walachian denarius, as complying to the system of Hungarian denarii. 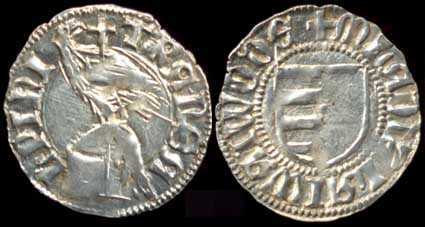 In which concerns its pattern (obverse - reverse), it belongs to the most common denarius and ducat type, type that occured to almost every coin issue of the Walachian princes, since Vlaicu I (1364 - 1377) to Basarab (the Old) Laiotă (1473 - 1477, with many interruptions). The legends on the coinage of Vlaicu I were written both in Latin and Cyrillic (Slavic). This one uses Latin. There are plenty of other variants in which concerns the legend, its respective fonts and of course misspellings. According to the Bible of Romanian numismatics, Monede şi bancnote româneşti by George Buzdugan, Octavian Luchian and Constantin Oprescu (1977), this denarius is classified as belonging to the common type of the Walachian denarii and ducats.